Here are five burning questions as UNLV’s football team prepares to host Idaho at 6 p.m. Saturday at Sam Boyd Stadium. 1. Will the Rebels defense improve? After giving up more than 30 points and 400 yards per game in each of the last eight seasons, the Rebels (1-2) allowed an average of 43 points and 499 yards in their last two games at UCLA and Central Michigan, where they surrendered six touchdown passes Saturday to Chippewas quarterback Cooper Rush. The good news for UNLV is that it won’t face another NFL-caliber quarterback anytime soon and should tighten things up against the Vandals (1-2), who have scored 40 points in three games this season and are 118th of 128 Football Bowl Subdivision schools in total offense with 310.7 yards per game. 2. Will Johnny Stanton regain his prior form? The UNLV junior quarterback followed up his dynamic debut against Jackson State (10-for-12, 217 yards, three touchdowns, no interceptions) with a pair of subpar performances against UCLA and Central Michigan (combined 26-for-69, 284 yards, two touchdowns, four interceptions). Idaho’s defense should be a welcome sight for Stanton as the Vandals are 108th in the nation in passing yards allowed (277.3 ypg) and have the country’s fourth-worst scoring defense (44 ppg). 3. Will the Rebels’ receivers hold on to the ball? While Stanton was consistently off target in Michigan, UNLV’s young receiving corps didn’t do him any favors by dropping seven balls. Devonte Boyd, a preseason All-Mountain West pick, was held without a catch for the first time in 28 career games for the Rebels, but accounted for three of the drops. While Boyd is a proven producer, UNLV also needs production from wideouts Darren Woods Jr., a redshirt freshman, and Mekhi Stevenson, a true freshman, along with senior tight end Andrew Price, who also has dropped balls this year. 4. Will UNLV get the running game going again? The Rebels are 43rd in the country in rushing offense, with 212.3 ypg, but take away Lexington Thomas’ 85-yard touchdown run against Central Michigan, and UNLV rushed for only 97 yards on 37 carries for a 2.6-yard average. Thomas, who is 23rd in the country in rushing yards with 293, has two straight 100-yard games and five in his career despite only three career starts. Look for the sophomore from Houston to keep on running strong against Idaho, which ranks 74th in the nation in rushing defense (153 ypg). 5. Will the Rebels cover the spread? UNLV struggled against Football Championship Subdivision schools in the past, but under second-year coach Tony Sanchez, the Rebels have soundly defeated the schools they were supposed to beat. UNLV annihilated FCS foe Idaho State 80-8 last season and smoked FCS side Jackson State 63-13 to open this season while also beating a sliding Hawaii squad 41-21 last year. The Vandals, who are voluntarily dropping down to the FCS in 2018, lost their last two at Washington and Washington State by a combined score of 115-20 and now will face a focused UNLV team in their third straight road game. 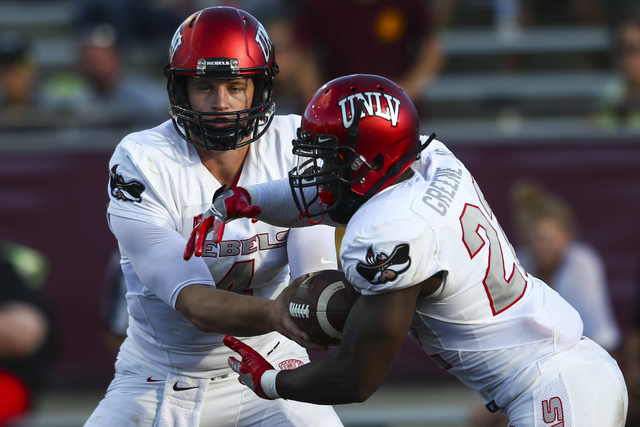 UNLV opened as an 8½-point favorite in this one in May and the line has since moved to 15. It could go as high as 19½ and it wouldn’t matter as the Rebels get back on track in a big way in a 41-21 win.